Sunday marked the return of the Chicago Food Swap after a two-month break. The September swap was the first event in the Chicago Food Swap’s new, permanent home, the Fearless Food Kitchen in the Broadway Armory field house. This roomy, light-filled teaching kitchen, operated by the community gardening nonprofit Peterson Garden Project, makes a perfect location for a food swap: its pristine stainless steel counters and rustic farm table provide more than enough space for swappers to set up their wares. I could not be more grateful to have found a home for the food swap at this moment in our history and what a beautiful home it is. One of the highlights of the September swap was the presence of our sponsor, Nielsen-Massey Vanillas. 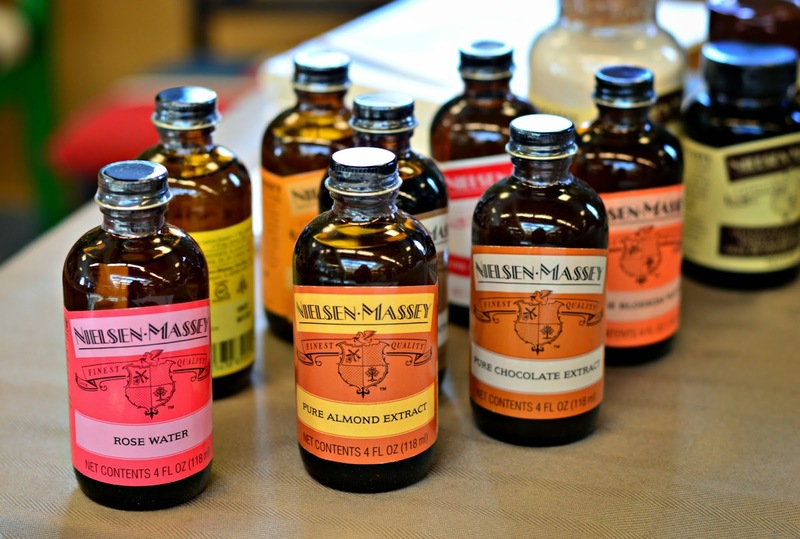 A local company, Nielsen-Massey makes the finest vanilla extract that I have ever used. Ask a professional pastry chef or candy-maker what vanilla he or she uses and I guarantee that the answer will be Nielsen-Massey. Of course, Nielsen-Massey also makes many other flavorings, including those pictured above. At the swap, representatives from Nielsen-Massey brought three different vanillas for the swappers to smell, which was fascinating. (Oh that Tahitian vanilla!) And everyone got to take home a 2 oz. sample of Nielsen-Massey’s signature Madagascar Bourbon Vanilla Extract. What a great addition to the swap! It was heart-warming to see so many familiar faces at Sunday’s swap, especially after a two-month hiatus, and there were many new faces as well. Plainly folks were ready for decorative gourd season because I saw a lot of pumpkin goodies, from my own pumpkin cupcakes with spiced buttercream and Gena’s pumpkin chocolate mini Bundt cakes to Hope’s gluten-free pumpkin poppers. And if a baked good wasn’t pumpkin-flavored, it was apple flavored, like Emmie’s apple scones and Morgan’s apple cider caramels. September being the end of summer canning season, many people had brought food in jars, from jams and jellies to pickles. I brought apricot butter and pickled beets myself. I also saw pickled okra, pickled grape tomatoes, and pickled cherries and a wide variety of really unusual and creative jams. Swapper Christina opted to use some of her homemade jams in these beautiful jam tarts. I always say that there is not enough savory stuff at the swap, and Sunday was no exception. But, I noticed at least four swappers offering soup and they were all mobbed with offers, including some from me. I came home with red lentil soup from Laura, vegetarian chili from vegan swapper Betsy and cream of potato and celery soup from veteran swapper Chris. To go with that soup, naturally I had to swap for some sourdough naan! I beat out another swapper for the last of Sandy’s vegetable pasta salad and it made a terrific lunch today. But, of course, the sweets were as popular as always. Jennifer, AKA The Marshmallow Fairy, was back with her amazing flavored confections, made with Nielsen-Massey vanilla bean paste naturally, and some honey from her own bees. That honey was probably the hottest item at the swap. I was also very impressed with chocolate raspberry macarons brought by a new swapper and could not resist bringing some home, even though Zuzu can’t eat them due to her nut allergy and my husband won’t eat them because of an irrational prejudice against raspberry. Among the other offerings were drink syrups, several kinds of hummus, tomatillo sauce, hot sauce, preserved lemons, fresh pasta, compound butter and so much more. 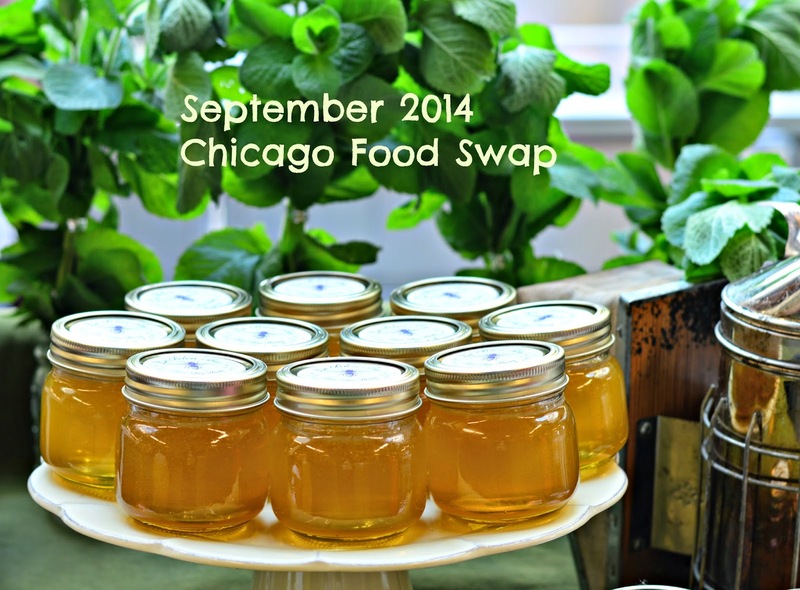 The creativity and skill demonstrated by the Chicago Food Swap community never fails to impress. So why not join us for the next swap? It’s happening on October 19 at 2 pm back at the Fearless Food Kitchen. Registration is open. Hope to see many of you there! The reason I liked here is that this place for NYC events is so intimate and personable and while having astounding atmosphere! Really more suited and perfect for experiencing great food and having a good time.